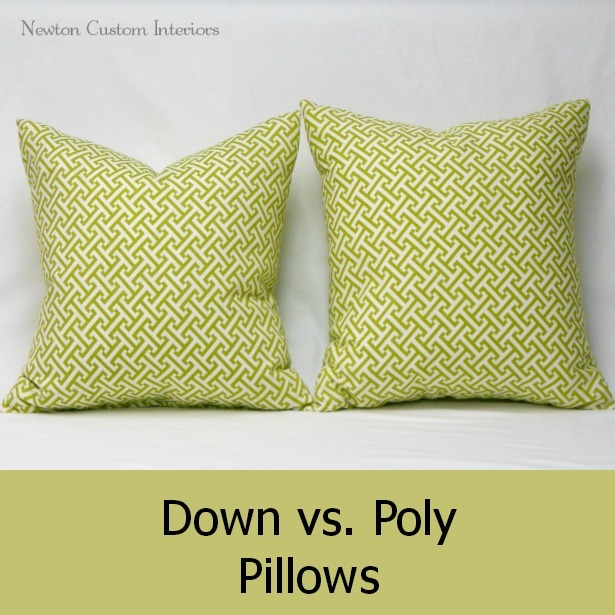 Today I thought we would talk a little bit about down pillows, and how they differ from polyester pillows. I love the feel and heft of a good down pillow. They are a higher end pillow, and more expensive, but in certain cases they’re a better option. Down pillows can be a better option than polyester forms when you’d like to have a nice full pillow. They are also great for people who like the karate chop look to their pillows. In the picture below you can see that the down pillow (on the left) is a much fuller pillow than the polyester. You can also see that I have given the down pillow a karate chop in the center of the top, and with a down pillow it will stay that way for a long time. Some people like down pillows because they can have more of a shabby chic look, depending on the fabric. They’re also a better option if you have leather furniture. Polyester forms like to slip down on leather furniture, but down forms have more of a base that they sit on, so they don’t slip as much. Even though I have been referring to them as down, the inserts that I get are a combination of down and feather. I usually like the 25% down/75%feather mixture. I did want to point out that when I make a down decorative pillow, I do cut the fabric a little differently than if I am making a pillow with a polyester form. In my How To Make A Pillow post I show that to make a pillow cover for a 20″ X 20″ polyester pillow form, I would cut my pillow squares at 20″ X 20″. But, if I’m using a 20″ X 20″ down pillow form, I would cut my pillow squares at 19″ X 19″. Doing this will make sure that the pillow cover is not too loose. So, do you have preference for your pillows – down or polyester? Would love it if you’d stop by. Thanks Sinea! I agree, I like the plumper look better too. I’m with you, down pillows all the way. 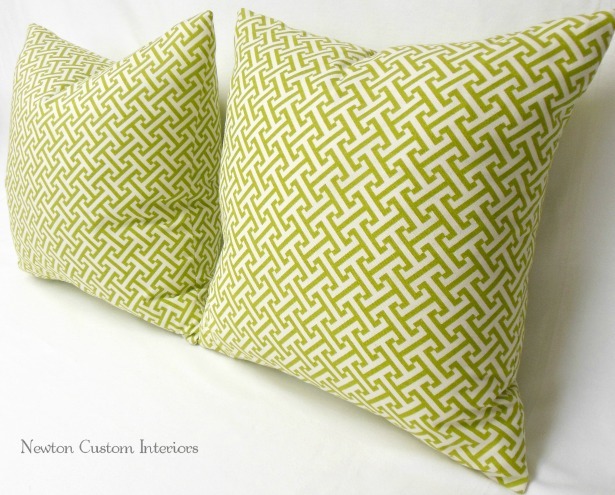 My workroom calls me the pillow lady because no one gets more toss cushions made for clients than me, haha! Maria, that’s funny – the pillow lady. Pillows are a great way to add a little splash of color or pattern to a room. I am new to your blog, but I have enjoyed esveral of your great posts already…. so THANKS! when you say that you get the 25/75 down inserts, do you have a source that you could share where a person (like me 🙂 could get a reasonably priced insert? I looked around some, but they all seem so expensive to me!!! I ended up buying a large bulk bag of down-alternative stuffing (cheaper than individual pillows) and it was pretty good, the quality was somewhere between poly and down – but I would LOVE to have nice down pillows. I don’t even know if you will see this comment since this is an older post…and you can feel free to e-mail me any info you would want to share, if that is easier. THANKS!!! Thanks Julie! Unfortunately I don’t know of an inexpensive down form source. Down is going to be more expensive than poly. I just found your website and your postings on down pillows. I purchased several down pillow forms (website was fabric.com when they had a sale (they only cost about $5-$7 per pillow form on sale at the time last year (for the person who was interested in an inexpensive down pillow form outlet). I really like how the pillows look, but I have problems with the feathers poking through the fabric. I’m a new sewer (quilter, actually) and figured if I used batting, I wouldn’t have this problem with the feathers poking out. I find feathers all over the sofa and floor. What can I do to keep my feathers from poking through the fabric? I’m glad I found your website because besides the tutorials on pillows, I found one on making a cover for my Kindle.! Thank you! Sandy, the pillow form covers may not be the highest quality fabric, and / or the outside pillow fabric may not be a tightly woven fabric. One thing you can try is to make a new cover to go over the pillow form cover. I would make it out of a black out lining. That really helps the feathers stay put. Good luck! Great post! I have found a great source for down/feather pillows at IKEA, they don’t have every size, but they do have some of the more popular sizes. I have found that the pillow cover fabric on any down/feather pillow form is what needs to be looked at carefully, just as Jann said, if you have feathers coming through or poking through, you need a tighter weave fabric to prevent this. Also, thrift stores can be a cheap source down/feather pillows, you will need to wash them and dry them carefully, I use tennis balls in the dryer, which will fluff them up.